The Houston brothers (Sam, Andrew Jackson, and William) came from California and established a ranch at Star Valley. They brought red, roan, and white Durham cattle to this area. In 1879, the John Sanders family, Mormon settlers, drove cattle from St. George, Utah, to the Gisela area. Joseph Gibson and his family moved into the area now known as Round Valley in 1881. At this same time, a group of Mormon families were settling in Pine. Some of these people had first settled at Mazatzal City but moved to Pine because of the Apache raids. The Pine settlers included the Fuller brothers, the Randall boys, the Lazears, the Hunts, and the Allens. Cattle and horses were brought from southern Utah and placed on the East Verde about 12 miles south of Pine. N. B. Chilson, Judge Lawler, and John Gilliland were also ranching on the East Verde. Paul Vogel and Bill Craig, some of the first settlers in Payson, came to this area as miners but ended up as ranchers. They founded the Spade Ranch on the Upper East Verde. In 1886 William and Harvey Colcord brought in Galloway cattle and settled into the central basin area. Most of the herds brought to this area from California, Utah, and Oregon were small herds up to 500 head of cattle. Larger herds were driven to this area from Texas. Col. Jesse Ellison brought 2,000 head from Texas. Sam Haught and Mr. Moor each brought in 700 head (also from Texas). Cattle country was from Payson to Star Valley to Christopher Creek to Pine to Strawberry and over to Pleasant Valley. There was plenty of grass and water to fatten the cattle! The cowmen of Rim Country supported the nearby towns by selling calves that brought money to the communities to pay the teacher, preacher, grocery man, and blacksmith for food, clothing, and services. However, by 1890 the cattle market was getting soft. Many cattle roamed the grasslands for 6 to 7 years because they could not be sold. By 1900, the cattle market was a disaster. The drought of 1904 and 1905 put some ranchers out of business. Although cattle ranching continued in Rim Country, it was on a smaller scale than before. 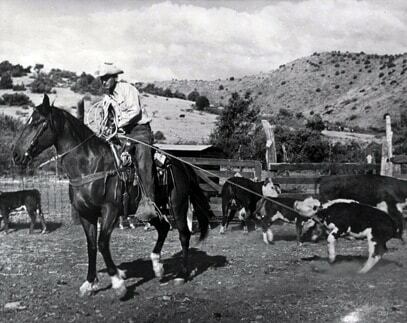 Open range conditions existed in Rim Country through the mid 1900’s, with herds from various ranches grazing together. At roundup time cowboys representing all ranches in the area helped with the “cooperative” branding. Calves were automatically branded with the same brand as that on the mother cow. Often the cattle were given a distinctive notch on their ears as an additional means of owner identification. Bulls were also castrated during the roundup. Cattle to be sold were then headed to market. The community herd in Tonto Basin was driven to Globe…the easiest route from that area. Cattle from Gisela, Round Valley, Rye Creek, and the Doll Baby Ranch were brought through Payson. The cattle were grouped into one large herd and the cowboys made camp out on Doll Baby Road before driving them right down Main Street the next morning. Cattle could be shipped from Holbrook or Winslow. If Holbrook was the shipping point, the cowboys would make camp at the Ogilvie Ranch in Star Valley on the second night. The third night would find them in Little Green Valley with future camps at the Hunt Ranch in Gordon Canyon and then the OW Ranch on Canyon Creek. The next trek was up the Mogollon Rim and on to Holbrook. If Winslow was to be the shipping point, the herd would be driven up the East Verde River on “the old Moqui Trail”. Camp would be made at Belluzzi’s Rim Trail Ranch, with the animals kept at night in “traps” (barbed wire enclosures large enough to hold 400 – 500 head). With the outbreak of World War II, most of the cowboys went off to the war. The big cattle drives were no longer feasible. With the improvement of the roads in the area, cattle could be shipped by truck and the large cattle drive became a thing of the past. The drought of 1904 and 1905 wasn’t the last one for Arizona. A major drought occurred again in the Dust Bowl years of 1933 and 1934. This time Washington entered the picture as the Agricultural Adjustment Administration which was formed in 1933 as part of Franklin Delano Roosevelt’s New Deal program. It reduced agricultural production by paying farmers subsidies not to plant on part of their land. It also called for the killing off of excess livestock. $100 million was spent to buy starving cattle. The goal was to promote a rise in value by reducing surplus. The Taylor Grazing Act of 1934 placed federal and state agencies in control of livestock numbers on public lands. Before the turn of the 19th century, cattle had roamed freely and fences did not exist. After the formation of the Forest Service in 1905, grazing fees were later instated in 1906 permitting cattle to graze on Forest Service land. The Taylor Grazing Act expanded unreserved public lands to be placed in grazing districts administered by the Department of the Interior. The law was later amended such that it now sets no limit on the amount of lands in grazing districts. There are currently 162,000,000 acres inside grazing allotments. Ranchers are required to pay a fee for grazing permits. A permit cannot exceed 10 years, but it is renewable. The government can revoke permits because of severe drought or other natural disasters that deplete grazing lands. Most of the land in Arizona is owned by the federal government with a good portion leased as grazing land to ranchers. After 1950 there was a sizable reduction in the amount of grazing land available for lease caused by higher fees and restrictions in the name of land conservation.